Everything's bigger in Texas, they say, and the state capitol building is no exception. Today's statehouse is the third to serve that purpose, replacing the second capitol, lost to fire in 1881, at the same location on one of the city's highest points. When it was completed in 1885, the 311-ft. tall edifice with 360,000 square feet of space was billed as the "seventh largest building in the world." 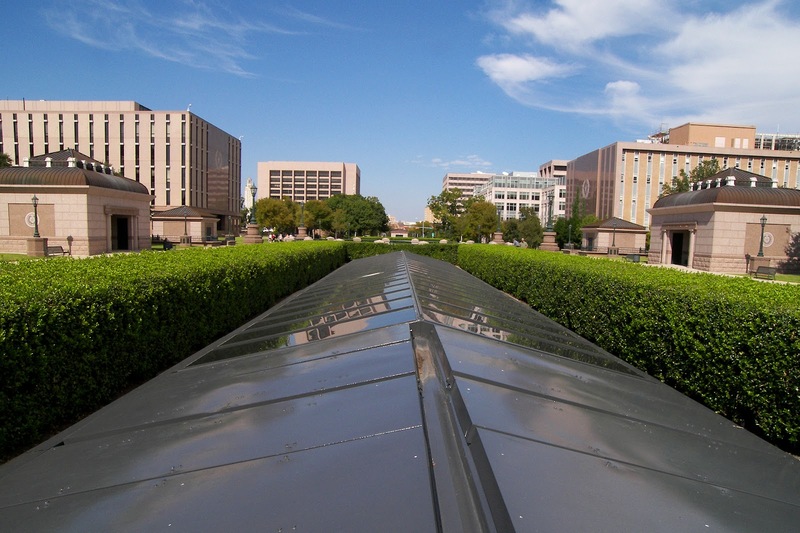 Though many industrial facilities have far exceeded that area, it remains the largest state capitol in the U.S. Even before the old statehouse burned, plans were underway to build a larger and grander capitol building. A national design competition attracted entries from eight architectural firms, and the Italian Renaissance Revival design of a Detroit architect, influenced by the U.S. Capitol, was selected. 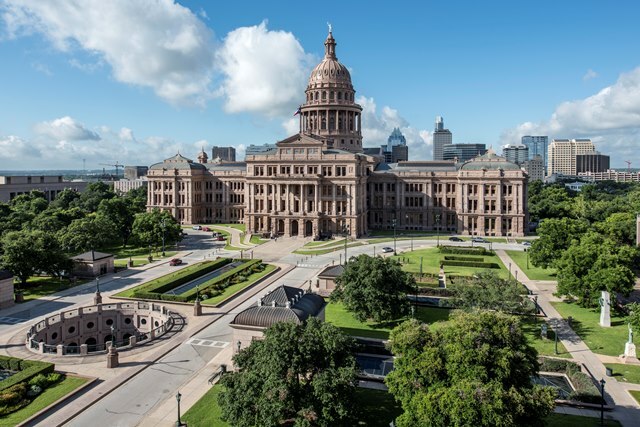 The original concept called for the use of Texas Hill Country limestone on the exterior, but its iron content was so high that the first applications on the lower reaches became discolored with rust stains when exposed to the elements. 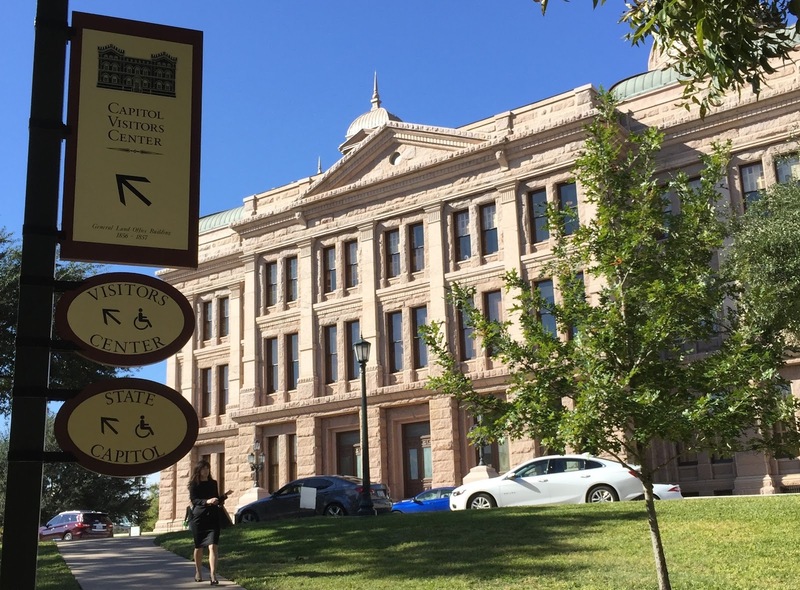 Hearing about this dilemma, a quarry near Marble Falls offered to donate sunset red granite to finish the exterior, a gift the architect and builder gladly accepted. 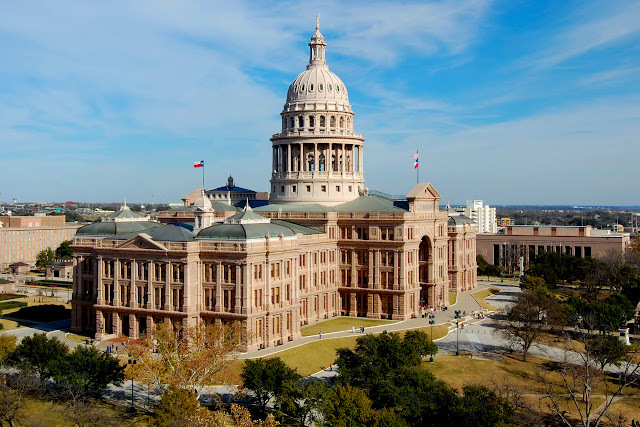 Subsequently, red granite was used for numerous other state government buildings in the capitol area. Six years after ground was broken, the new and much bigger Texas statehouse, completed at a cost of $3.7 million, was celebrated with a grand opening complete with elegant parties and jubilant parades. Like most statehouses of traditional design, the centerpiece of the building is the rotunda. 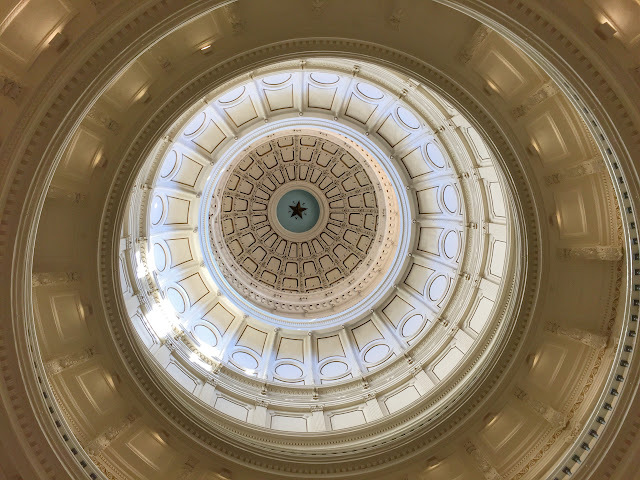 Stretching majestically four stories from ground level to the dome, the Texas rotunda is lined with portraits of Texas governors and presidents of the Republic of Texas. The paintings are hung in chronological order with the most recent governors on the first floor. When a new portrait is added, previous ones are rotated upward. THOUGH IT LOOKS TINY, THE STAR AT THE TOP OF THE DOME MEASURES 8 FEET ACROSS. The interior of the dome, 218 feet above the ground floor below, is decorated with only architectural detail and trim. 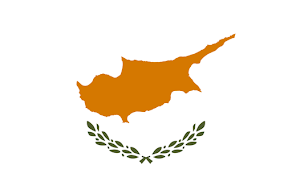 At the center is a five-pointed star with letters spelling out T-E-X-A-S in the spaces between the points. This thematic treatment combining the five points and the five letters of the state name is used frequently throughout the building. 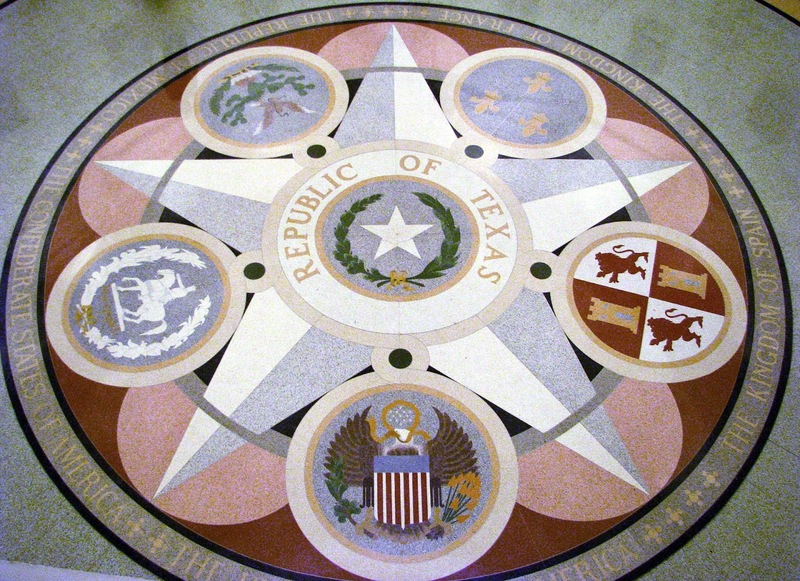 A terrazzo mosaic on the rotunda floor depicts the great seals of the six governments which have ruled over Texas—France, Spain, Mexico, the Confederacy, the United States, and the Republic of Texas, which is given central billing. 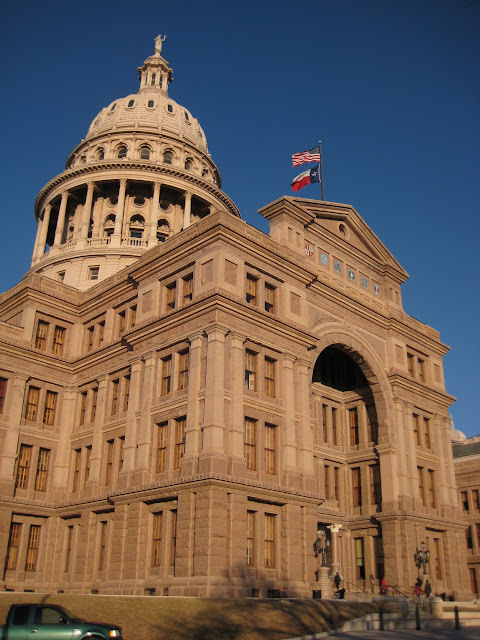 In 1983, the Texas State Capitol suffered extensive fire damage after a conflagration which began in the apartment of the lieutenant governor. 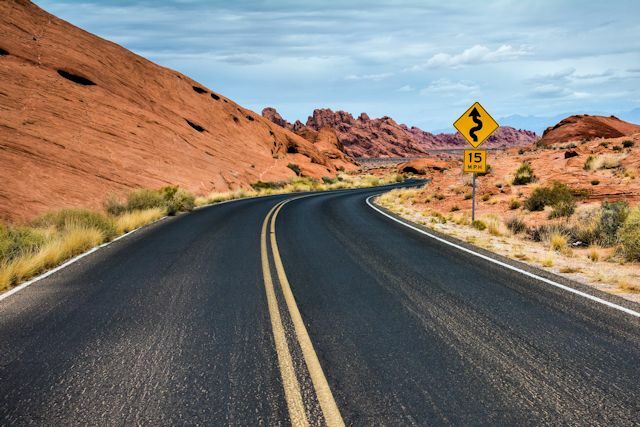 At the end of a ten-year construction project to restore the building and update its infrastructure systems, officials recognized that state government still desperately needed more storage and office space. After all, the population of Texas had increased sevenfold since the statehouse was built. The most obvious solution was to add a wing, but the only feasible construction location would have blocked the view of the capitol's historic north facade and covered an important public plaza. After much deliberation and consideration, a four-story annex was built, adding 667,000 square feet, almost doubling the size of the statehouse. Only the large skylights hidden between planters and an open-air rotunda give away the location of this subterranean addition. 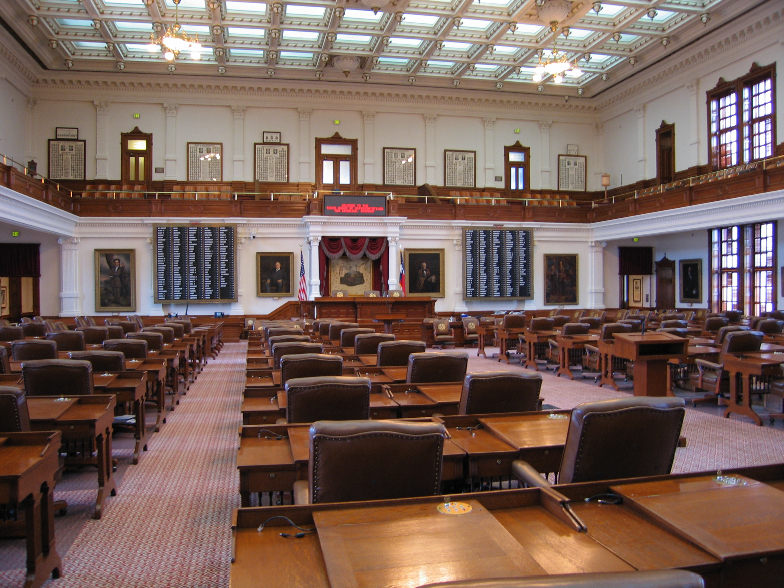 Having visited a total of 30 state capitol buildings now, we found the Texas version to be in the middle of the pack. It certainly wins the size prize, but many that we've seen have more architectural appeal and considerably more state symbolism and history incorporated in their designs. 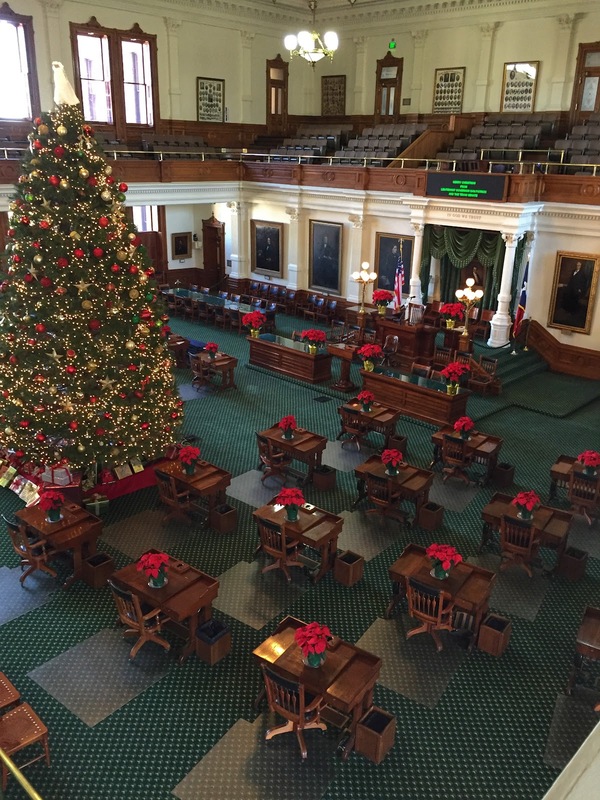 The interior was particularly lacking in meaningful decor with many blank walls and missed opportunities to showcase what is so special about Texas. FOLLOW THE SIGNS OR YOUR EYES? Parking was convenient, just a block away, but there was some confusion when we arrived regarding where to go. When we reached the capitol grounds, we saw prominent signs pointing to the Capitol Visitors Center. Even though following the arrows was taking us away from the capitol building, we assumed that a stop at the visitors center was required before being allowed to enter the statehouse—like at the U.S. Capitol. Only after we walked a hundred yards out of the way to reach the center did we learn that it's just a museum with exhibits about the capitol and other unrelated topics (e.g., the tales of O. Henry). If we wanted to visit the capitol, attendants at the center assured us, we could just walk right into the building. Later in the day, we visited the LBJ Library and Museum on the campus of the University of Texas at Austin, but that's a story for another post. • Height Advantage over U.S. Capitol: 23 ft. 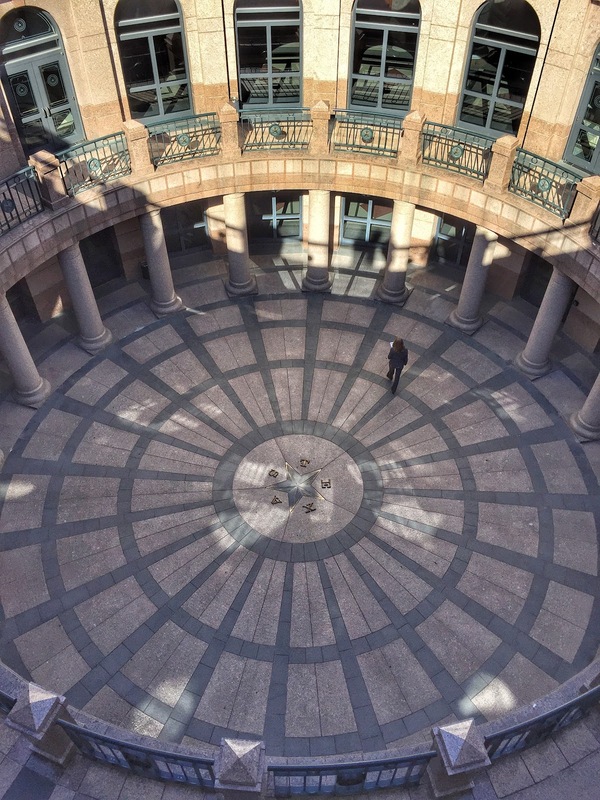 Loved: The clever way that state officials expanded the capitol to add needed space without destroying the building's historic appearance. Lacking: A visible wow factor. The most interesting facet of America's largest statehouse is the fact that two-thirds of it is invisible from the street level. As for the exterior you can see, it's big and it's pink, and...it's big and pink. Learned: Filibuster rules in the Texas Senate are not for the faint of heart. 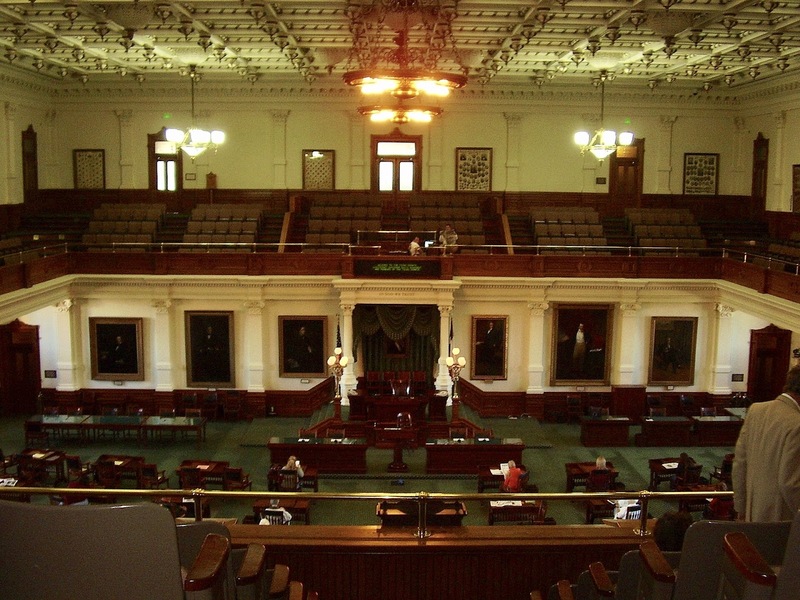 When speaking during a filibuster, a senator is limited to topics relevant to the bill being discussed and cannot eat, drink or use the restroom during the speech. The rules also prohibit sitting or leaning on a desk or chair under any circumstances when the senator has the floor and is speaking on the bill or resolution. After three violations of these rules, the speaker is required to yield the floor. FROM THE ATRIUM, ONE CAN SEE THE LEGISLATIVE LIBRARY. THE OPEN-AIR ROTUNDA OF THE UNDERGROUND ANNEX. TEXAS SENATE CHRISTMAS DECORATING: GO BIG OR GO HOME.